According to a press release dated May 17, Edison International’s (NYSE:EIX) electricity utility, Southern California Edison (SCE), has requested approval to build and test a commercial 600 MW power plant to determine the feasibility of a new combination of several advanced “clean” coal technologies in an effort to advance these emerging approaches to low-carbon generation. A gasifier that combines coal and steam with a controlled amount of oxygen under high pressures to produce hydrogen and carbon monoxide. Converting the carbon monoxide to additional hydrogen and carbon dioxide in the shift conversion. Further processing the gasses to remove sulfur, mercury, and carbon dioxide. Sequestering the carbon in a depleted oil formation, enabling enhanced oil recovery, or in a deep saline formation. Producing a mostly hydrogen fuel, emitting only 10 percent of the carbon released by an integrated gasification combined-cycle coal project without carbon capture. The hydrogen is fed to gas turbines where electricity is generated. Exhaust heat from the gas turbines is used to create steam and drive additional turbines. The use of these technologies in a full-scale, 600-megawatt (MW) commercial generating facility. 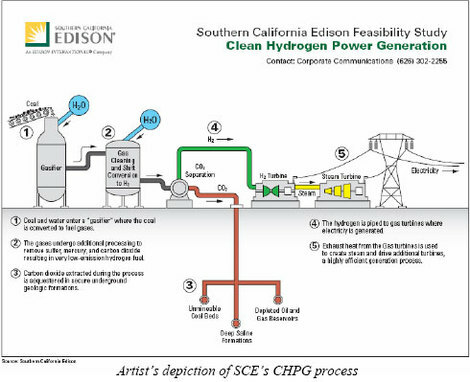 The advanced technologies in SCE’s proposed study, an approach the utility calls Clean Hydrogen Power Generation (CHPG), are being considered or tested in clean coal projects elsewhere. The SCE plan would be the first assessment of a full-scale, 600-MW facility using all of them. One of the main differences between this process and others is that the carbon monoxide is converted to additional hydrogen enabling the gas turbines to only burn hydrogen. SCE is seeking authorization to commit $52 million of revenues it collects from customer rates during a two-year period to an advanced technology feasibility study. If approved, this would represent less than a quarter of one percent of current customer rates. SCE also is the nation’s leading purchaser of renewable energy, buying and delivering approximately 13 billion kWh in 2006 from wind, solar, biomass, biogas, geothermal, and small hydro suppliers – 16.7% of the power it delivered to customers. An equivalent amount of generation using fossil fuels would produce 7 million tons of GHG emissions. SCE purchases one-sixth of all U.S. renewable energy used to generate electricity for retail sale, including more than 90% of all the U.S. solar generation. The above article was adapted from the press release referred to in the first paragraph. CO -> H2 ... ?? This is a coal fired power plant. I do not have a problem with coal fired power plants. I do have a problem with the dishonest press release that come out of California. It is just another feasibility study but this time SCE wants the rate payers to pick up the tab. Again, I do not have a problem with rate payers picking up the tab since IOU are limited in the profits they can make. It is all the BS about how green they are that makes me sick. 3.Oxidation of of natural gas. These four good ways account for 99% of the electricity produced in the world. There are many alternative ways of making. Just read yesterday where California is pushing solar and is now rewriting legislation because consumers who install solar panels are getting screwed. When I first read the old legislation a few years ago to promote one million solar roofs in California, I predicted it would fail. Here why? Making electricity with solar is difficult. It takes lots of skill on the part of utilities. So far none have been successful and doing much more than issuing misleading press releases. Very few consumers have the necessary skills to purchase and operate solar systems. As a result not very much electricity is produced. SCE is required to pay consumers Time of Use (TOU) rates for the electricity they produce. Of course this meant that consumers would also pay TOU rates for their use. So what happened after consumer paid $12k to $40k for solar panels? Their electric bill went up because they had to pay TOU rates for the amount of electricity the solar panels did not produce during peak periods. Compare this to coverting coal to natural gas underground. The methane drive the combined cycle generation plant, the cO2 can still be sequestered. Although I would prefer solar collector algae sequestration. And distributed generation with fuel cell/turbines running on the natural gas. All the pipelines are already in place. This scheme that depends on coal mines is much less efficient. Mining, coal transport, waste left from the process, and the high capital costs for the power plant are huge drawbacks. The GHGs emitted from mining and transport of coal alone are huge. If we use coal at all we ought to turn it into natural gas underground first, leaving the mess where it sits and the clean energy. All those distributed fuel cell/turbines would run on biogas as well and provide needed backup so that the grid could transition to mainly wind, water, and solar power. The waste heat from the fuel cell/turbines can be used to replace fossil fuel heating/cooling. Saving another huge GHG output and an expense, energy for heating and cooling, that is also bankrupting families and businesses daily. Family homes foreclosed upon and energy assistance for retired people on fixed incomes straining, it is a hidden cost of fossil fuelishness. Kit, The only skill PG&E required to let me install a PV array on my roof was the skill to install a TOU meter. The PG&E guy was quite good at it. It took him only a few minutes. The only skill I needed as a consumer to purchase an operate a solar system was the ability to sign checks. The ability to wash my solar panels once or twice a year is helpful but not necessary. Don't confuse high cost with difficulty and necessary skills. We paid $40K for our solar panels almost 4 years ago. We are on TOU, and it has saved us over $9000 so far. While the residential side of the California Solar Initiative is doing poorly, the commercial side is doing well. I'm not ready to call it a total failure. Oh, the PG&E guy also had the skill to test that if grid power was removed from our house, the power from our PV array would also turn off and not be fed into the grid. He was great at that too. I think he couldn't be a licensed electrician if he couldn't do something that simple. Well Clee, tell me more. I would be interested in about where you live and what elevation. Since I designed my own solar hot water system in California, this will help my determine just how bad and economic and environmental choice you have made. Clee no doubt was thinking that I would give him a BZ for making a $40k investment with a 15 to 20 year payback. Very pathetic ROI. So Clee, did PG&E or anyone else try you make a better investment? It would not be possible for my family to save nine grand in 4 years because we do not spend that much in my all electric home in a more energy intensive climate. CLEE ever hear of conservation? I live half way between San Francisco and San Jose, about 25 feet above sea level. We get about 10,000 KWH out of our PV system a year. Sure, PV has an energy payback better than natural gas and worse than nuclear and wind. Sure, PV has an environmental payback better than natural gas and coal, and worse than nuclear or wind. Sure 15 years is a not a great payback (We save more on our power bill each year as electricity surcharges increase) I never said it wasn't expensive. I never said PG&E wasn't a slimey bunch trying to cheat me. In fact just changing the electricity meter reduced our alleged monthly KWH usage by 46%, saving us an additional $2000 a year. I think they've been overcharging us for years with the old meter. Add together the savings from the new more accurate meter with the solar savings, I think we'll have payback in 10 years. I don't care if it takes 20 years to pay back. The panels will last at least 25 years, maybe 50. I'm paying for it on a 30 year mortgage so the amount we save on our electricity bill is larger than the amount we pay for the panels on the mortgage. So we have positive cash flow. But I don't see it as an investment that I need to get some huge ROI on. I see it as a hedge against ever increasing power bills, particularly as natural gas prices increase. I've been happy with the results of that hedge. Sure it's expensive, and I can't really blame you for not wanting to have to pay for it, and sure there's lots of misinformation out there. I just don't appreciate your adding more misinformation by claiming that PV is difficult or requires a lot of skill on the part of the consumer or utility. Silicon Solar isn't economical yet. CIGS Solar isn't quite on the market yet, but it looks it could easily reach the point where it's cheaper than nuclear, and trending towards the price of coal. As for conservation, California already does that in spades. Another interesting thing to note, Silicon Valley Edison has 90% of all the US solar capacity. somebody have the opinion from the energy commision from California. California need to looking for agreements to invest in BAJA, to produce new energy. Whups, I mean Southern California Edison. Clee, thanks for the feedback. If your system is about 6 kw, then you are getting about the performance I would expect for your location assuming not much fog or pollution. The reason I say solar PV does not work is because I have yet to find a system that is working after five years. Maybe you will change my opinion. However, your opinion about the future of your system is unfounded. Time will tell. The second reason I say solar PV does not work is because they are put in the wrong location. We can assume that Clee does not have a problem with moss growing. The purpose of picture solar panels is to have the solar panels in the foreground with your 'green' facilities in the background. Of course Clee being from California you know that there is no reason to build solar power plants because you can always conserve. A family of 4 in the bay area should have an average electric bill of $100/month assuming an all electric house. If your good at conservation $25/month is about right. See I just save Clee $4000 per year. He should have taken $40k for solar panels and bought a sail boat. Since he lives at 25 foot elevation he should be able to walk to the marina. Yargh. I don't want a sail boat. Talk about lousy ROI. Sailboats are really massive money sinks. They have to be repainted all the time and require expensive marina docking fees. Solar panels are much better. I enjoy them everyday. You can make assumptions as to whether I conserve or not, and the cheapest watt is the watt not used, but that doesn't change the fact that a photovoltaic system is easier to operate and maintain than a coal or natural gas fired power plant (or sail boat). There are no moving parts at high temperature and pressure in a PV system to wear and breakdown. I have no moss on my solar panels. It's so easy that using no unusual skills, I have a working solar system on my roof. The entire system has a 5 year warranty, and the solar panels have a 25 year warranty. "SMUD's first solar array, PV-1, the first utility-scale solar array in the nation, sits in the foreground of the cooling towers at the decommissioned Rancho Seco Nuclear Station. Since PV-1 was constructed in 1984, five more arrays have been built at the site"
You say it's difficult and requires lots of skills, but you haven't listed any difficulties or skills. It seems to me that you're just trying to spread fear, uncertainty and doubt with no facts to support it. Tell me about the systems you know about that have failed in less than 5 years. What was the failure mode? I helped install two systems in 1984 for my father and grandfather and they're still running without fault. Those systems are off the grid and so might not apply, but the panels have been good for 31 years. Kit P. If all you're worried about is ROI, then what are you doing on this site? The whole site is geared toward alternative energy and you're completely against everything except what you have now. Clee, again thanks for the feedback. Clee, thanks for linking a picture of solar panels that did not work for 5 years. Bad news about solar does not get reported. Your assumption is that a picture of solar panels indicates that they are producing electricity. And when Clee's solar panel stop working, he will not fix them. Just like SMUD. No, this pdf is what convinced me that this PV system has been running for over 20 years. I can't be sure it's running today, but it was running 3 years ago. "SMUD has provided national and international leadership in solar photovoltaics (PV) development beginning with the installation of the first large-scale photovoltaics utility plant (PV-1) at Rancho Seco in 1984. While considerable improvements have been made to PV systems during the past twenty years, this 1 MW facility today is still operating at 81% of its 1984 performance. " 20 years is a whole lot longer than 5 years. It's funny that you say it didn't work for 5 years when you have no data to support that false claim. Just like your baseless claims as to your unspecified difficulty and special skills needed by a utility or customer to have PV. Clee, your link did not work for me. SMUD may have fixed the panels after I left. However, you have again demonstrated to me that my claim is not baseless because you keep demonstrating that you lack the skill to purchase and operate a solar system. You should be looking for the annual cumulative generation along with the maintainable cost. Just for the record, the central valley is not an idea location for solar and SMUD has locations above the valley smog and tulley fog. While am not against solar, I am against con artist who market junk to well intention consumers. If SMUD is such a leader why are they not more open with their data. SMUD is a PUD. SMUD did have a program to own and maintain PV panels on ratepayers roofs. They determined that it was not in the general interest of ratepayers for SMUD to own the panels but it was in the ratepayers interest for customers to own panels. So the primary skill that Clee is lacking is a lack of a questioning attitude. You do not know what you do not know until you ask questions. Second, Clee has no clue if his panels are working correctly or how they might fail. greg woulf, please tell me more about the system you installed. I am interested in alternate energy being something more than an alternative or a photo op. I am will to pay more too but not for propaganda. Solar PV is uneconomical unless you have a big house and use a lot of electricity at the high tier rates. At low usage levels the math just doesn't work. 10,000 kwh is a lot of juice - my house in the same area uses 2,500 (through conservation alone). It's true that if you completely ignore the time value of money, you can make almost any system look like it will "pay back" - it just has to last long enough. But if you account for lost interest on the money, most systems will never pay back. $9,000 saved in 4 years? In a bank at 5% you could earn $2,000 a year; the system would have to last 40 years to pay back. Kudos for putting up PV anyway. In response to several comments I was at one time an employee of SCE. To my knowledge they are no longer running any coal burning power plants. They run two nuclear units, several hydro units, some natural gas peaker units along with some solar, wind and also purchase power from others of which some is green and some is from coal. They may be one of the greenest large utilities in the country. Around Dec 2006 they shutdown their Mohave generating station which was a coal slurry plant near Laughlin Nevada for environmental reasons. This clean burn hydrogen plan may be a way for them to experiment and possibly bring back an existing facilities which is setting idle. Why build a new unit when you can retrofit and older unit to run cleaner? Seems like a reasonable plan to me. Did SCE shut down Mohave because of greeness or were they forced to close after a long court battle? Over $9000 saved in less than 4 years (rounded down, not rounded to the nearest K). Now that the 4th year is complete, I can say we saved over $10,500 in 4 years. By your calculations, payback time with these updated numbers would be 16 years. I do have a 5% loan. $8000 of that $10,500 may have gone into interest payments, but don't forget that the remaining $2500 can be used to either pay down the mortgage faster, (lowering the loan interest $ in future years) or the $2500 can be earning 5% interest for the next 40 years. Payback time will be less than 16 years even including loan interest. What does SCE Generation and DWR Generation mean? I have an insane amount of money that I am being charged for one of these. I need to understand what is for! "...find a system that is working after five years...."
The original PV panels continued to produce power after 50 years. Spacecraft are still being powered by PV panels after 30 years. If PV panels stopped working after 5 years all the PV manufacturers would be going broke from warranty claims since almost all panels come with a 25 year warranty. Did you actually read the warranty Rob? It is like Clee’s post about PV at Rancho Seco, no mention was made of actual performance compared to rated and cost per kwh. Clee gets personal satisfaction from his PV system. I get satisfaction from my sail boat and spend the money to keep it floating. On the other hand, I am not suggesting that that sail boats are good investments or BART should provide sail boats should be used to provide commuter transportation. 5 years has passed since our photovoltaic system was installed. It is still working. We have saved over $14,000 on our electricity bills so far and still have positive cash flow from our PV system. PG&E is planning to raise their electricity rates again, so our payback period may become shorter. These days a California customer needs even less skills to have PV on their roof. With a solar lease, the installer monitors and guarantees performance and covers the maintenance and repair including replacing the inverter if necessary. It would be wise to pay attention to the annual increase in the monthly lease payments and compare it to how much you expect your utiility will increase their rates. But that is skill relating to whether or not it's financially advantageous. It is not a skill needed to operate the solar system. About Rancho Seco, this article on the 20th anniversary of their 1 MW PV1 array says that PV1 had generated approximately 31.3 GWh of electrical energy. For 1 MW over 20 years, I believe that comes out to a 17.8% capacity factor. They couldn't have gotten that much energy from the system if it only worked for 5 years. Well Clee, you have again demonstrated that you can calculate CF. What is the capacity factor of your system? What is the size of your system and how much electricity was produced? Clee, the links that Clee provided, and SMUD speak in the language of the con artist. I could never save $14,000 on electricity in five years because I would never come close to using that much electricity for all electric houses in much harsher climates. To properly judge the benefit of solar it is necessary to provide hourly production figures with corresponding figures for the generation that is off set by solar. While I an in favor of utility scale PV, the place for SMUD to put solar panels is at its hydro facilities and not in the central valley. This fixed array has a CF = 19%. Kit P, you've already previously done fairly good guestimates on the size of my system and its capacity factor. Congratulations. I don't care if SCE is a leader in anything or not. A friend of mine is planning on getting a PV system this year. This is made possible by the new solar leases available to homeowners. My friend will be using one of the companies I gave URLs for in my last post. These companies can take advantage of the full 30% federal tax credit instead of being limited to $2K per system. They pass the savings onto the customer so they no longer need to be at the highest tier rates that Doug mentioned, for it to make financial sense. Though it still won't make sense if you're in the lowest tier. I've always admitted that photovoltaics is fairly expensive and not for everyone. It's even implied in my last message. I don't think that makes me a con artist. I'm just continuing to refute your spread of fear, uncertainty and doubt with your making unsupported claims that it takes lots of skill on the part of utilities and customers to purchase and operate solar systems and that PV systems don't last past 5 years. You keep saying I have no skills. Fine, I may not have much skills, but I don't need them to have my solar system provide me with electricity every day, even after 5 years.